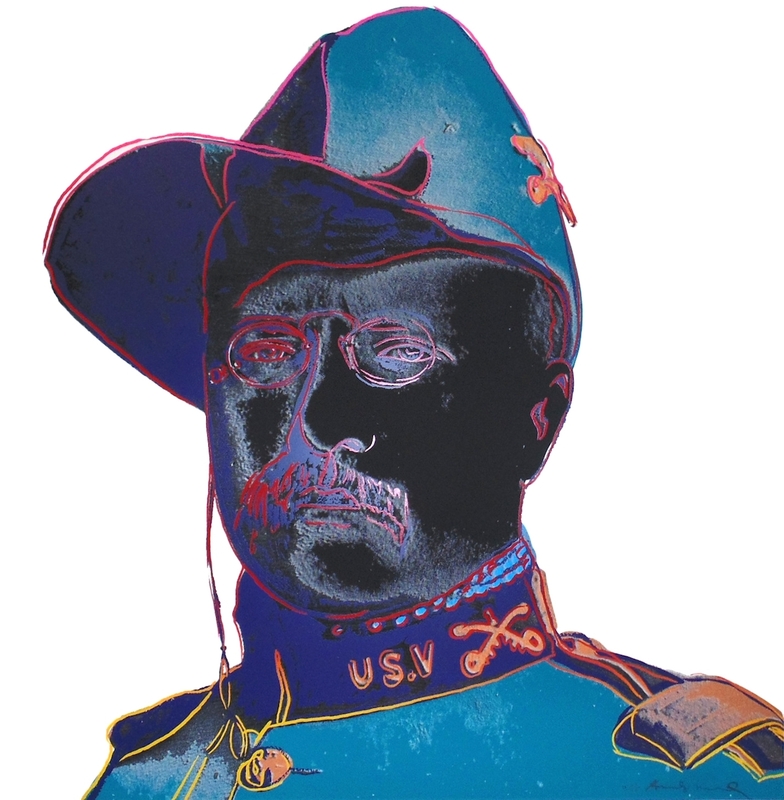 Andy Warhol’s Teddy Roosevelt created in 1986 depicts a young Lieutenant Colonel Roosevelt in his Rough Rider uniform from a photograph taken in 1898. This iconic print is a part of Warhol’s Cowboys and Indians series. In the Cowboys and Indians series, Warhol reconfigures images of the “Old American West”. He is less concerned with the truth behind some of the subjects (like John Wayne) as he is with their connection to American pop culture. Viewers may recognize the representation of Teddy Roosevelt immediately, but most would fail to name the original photographer who made this image so iconic. Warhol was drawn to the way images, like this one, worked their way into the fabric of collective American culture. Warhol interspersed recognizable portraits of well-known American “heroes”–John Wayne, Annie Oakley, Teddy Roosevelt, and General George Custer–with less familiar Native American images and motifs in his ironic commentary on Americans’ collective mythologizing of the historic West. Rather than portraying Native Americans within their historical landscape or Cowboys in their veritable forms, Warhol chose to portray a popular, romanticized version of the American West. The West that he chose to represent is familiar to everyone and can be seen in novels, films, TV series. He used the Cowboys and Indians series to explore the relationship between fact and legend.